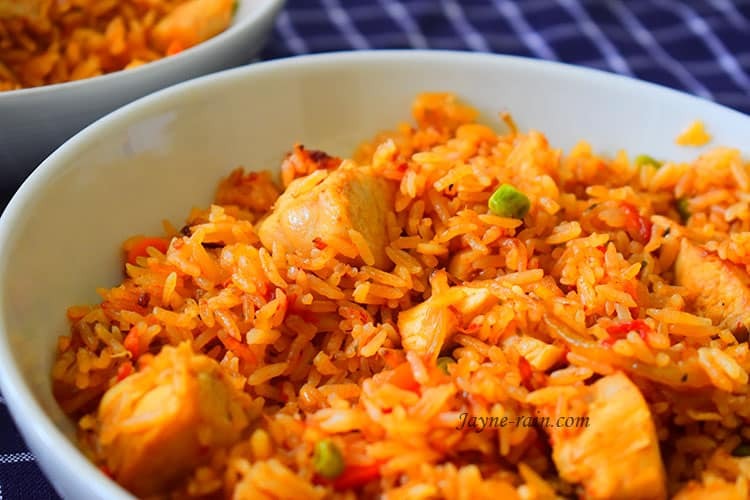 Chicken jollof rice is a frequent dish in my home. It is for the simple fact that, it is easy to make and incredibly delicious. I cook this jollof rice in a delightful blend of tomatoes, pepper, and herb. It is a very spicy affair, but you should adjust the number of scotch bonnet peppers to your tolerance. First of all, jollof rice is one of the most common dishes in West Africa consumed in Nigeria, Ghana, Cameroon, Senegal, Gambia, and Ivory Coast among others. A West African party without jollof rice is no party. The recipe itself originates from the Senegambia region but multiple regions in Africa debate over the geographical origin of Jollof rice. The most vigorous rivalry of them all is between Nigeria and Ghana. 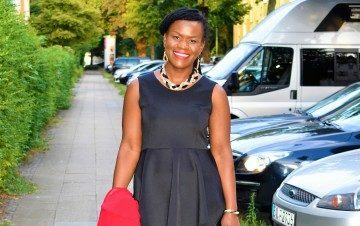 The two rivals also bitterly debate about which country’s Jollof rice taste better. The dish consists of rice, tomatoes, peppers, and onions among other spices and the recipe differ from region to region. The bright red color is a result of the tomatoes used in the dish. I love using chicken breast for my chicken jollof rice because it guarantees a quicker cooking time. Furthermore, it is lean and nutritious. For the perfect jollof rice make sure you don’t go overboard with your water. Always remember that rice is best steamed in a bit of water and not cooked in a lot of water. For perfect steaming, I seal my pot with aluminum foil during the cooking process and cook on the lowest heat. The quality of your jollof rice will depend heavily on how tasty your tomato and pepper sauce is. So, don’t rush the process. The amount of water used in this recipe may vary depending on the kind of rice you use. For example, Parboiled rice or brown rice may need a bit more water and longer cooking time. So adjust accordingly. I cook this jollof rice in a delightful blend of tomatoes, pepper, and herb. It is a very spicy affair, but you should adjust the number of scotch bonnet peppers to your tolerance. Put tomatoes, paprika and scotch bonnet in a food processor and blend to your desired consistency. Transfer the paste to a medium-sized pot on medium heat and boil until all the liquid has evaporated. Set aside. In a separate pan, heat the oil on medium heat. Add the chicken breast pieces and a pinch of salt and cook till lightly brown. Drain and set aside for later. In the same pot, add the onion and stir till lightly brown. Add garlic, ginger and the bay leaves. Keep stirring for another minute. Add the tomato paste and fry for 5 minutes until the tomato paste and the oil have mixed well. Follow by adding curry powder, thyme, bouillon cubes, salt and black pepper and stir for half a minute making sure that your spices don’t burn. Re-introduce the pre-cooked tomato-pepper mixture and give a few stirs. Cover the pot and allow to cook for about 10 minutes or until the tomatoes cook. Meanwhile, wash the rice thoroughly with lukewarm water until the water runs clear. Parboil the rice till 1/2 way cooked and drain the excess water. At this point, add the parboiled rice and the vegetables to the tomato sauce and stir well. You can taste at this point and adjust the seasoning accordingly. Reduce the heat to the lowest setting, seal the pot with foil paper and leave to cook for about 15 to 20 minutes, (the aim of this is to trap all the steam present in the pan because that is what is going to soften the rice further, since we are not adding any additional water.) This step will ensure that your rice doesn’t end up soggy and mushy. After that, re-introduce the cooked chicken into the pot and gently fluff the rice with a fork from bottom to top making sure the grains don’t break. The quality of your jollof rice will depend on how tasty your sauce is, so don't rush the process. 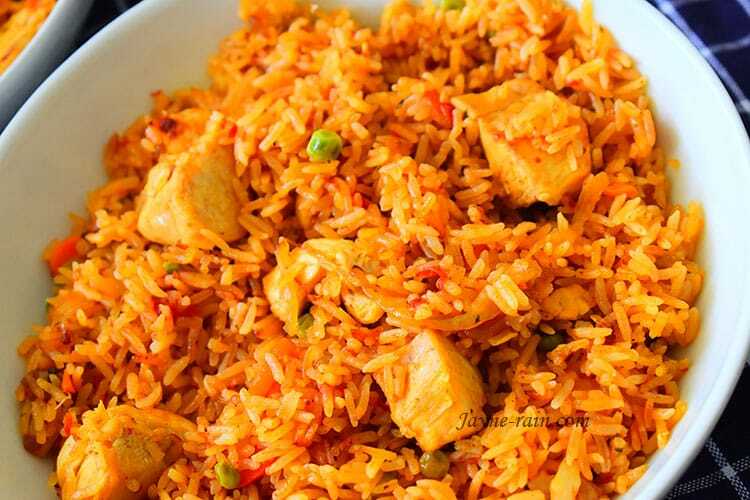 What do you think about this chicken jollof rice recipe? Have you tried it out? Meet me in the comment section below and share your thoughts. I would love to hear from you. If you love this recipe, you might also be interested in my Beef Pilau Rice HERE. This is wonderful osiepa. Your recipes are so great with very clear steps to follow. Thank you so much Lilian. I am glad you find them clear. Try some out and let me know what you think. Best regards! Thanks, my dear. Glad you stopped by.